Corolle is a beautiful French dolls range that caters from birth to 4 years onwards. For newborn babies is the Babi Corolle Collection featuring soft dolls & rattles in a range of colours from delicate pinks to vibrant cerise. 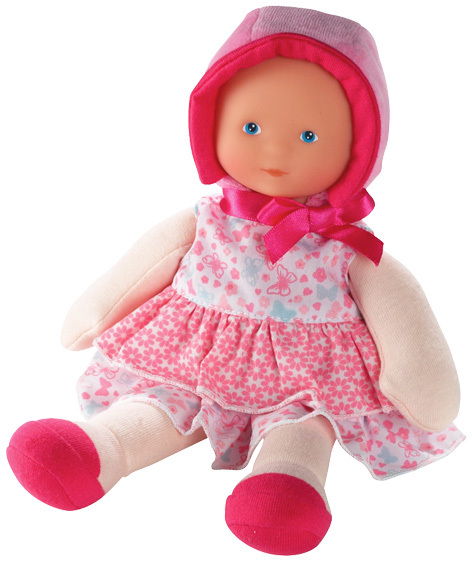 Miss Candy flowers is a perfect first doll for newborn girls. She is dressed in a soft bonnet and adorable white and pink dress detailed with flowers and butterflies. Measuring a petite 9.5 inches tall, this doll is the perfect gift to be cherished. She has a supple vinyl face and a super soft body, which makes her a great comforter & her long limbs are great for tugging & chewing on. Miss Candy Flowers' gorgeous vanilla scent brings her to life, making her the perfect addition to any little girl’s nursery. Please tell us what you think of Miss Candy Flowers Doll by Corolle.